We do not know much about what sorts of things Jesus did after his birth, since no information about his childhood or youthhood or early adulthood can really be found in the Bible. 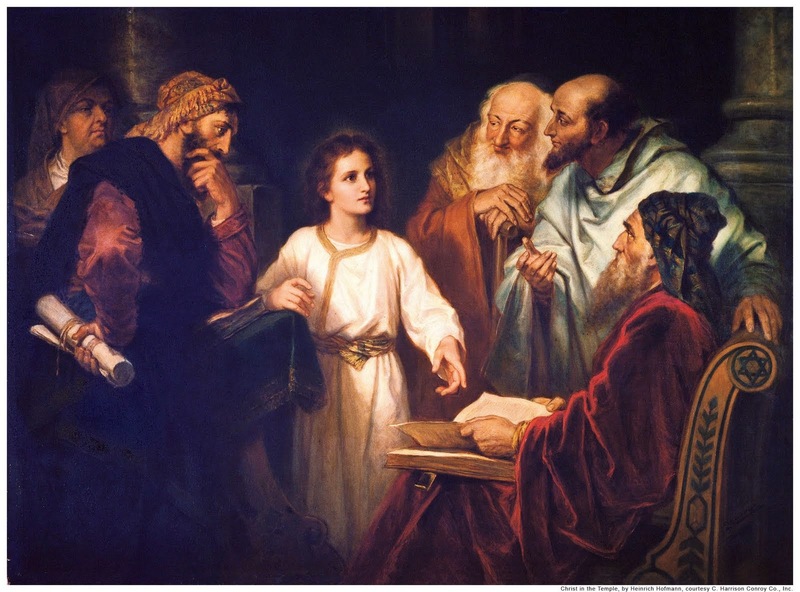 We do know that, when he was twelve, he stunned all of the learned men at the temple in Jerusalem with his profound wisdom and understanding, but that is it. It is only a glimpse. We know he went about doing his Father's business, but that's all we truly know without haphazardly speculating. It is interesting to think about how, even after all the glorious signs of his birth, Jesus went incognito for the first thirty years of his life. This is the Savior! This is the Messiah! This is the Lord! But Jesus did not draw attention to himself. He used this time to prepare himself for what was to come. "And he came to Nazareth, where he had been brought up: and, as his custom was, he went into the synagogue on the sabbath day, and stood up for to read. "The Spirit of the Lord is upon me, because he hath anointed me to preach the gospel to the poor; he hath sent me to heal the brokenhearted, to preach deliverance to the captives, and recovering of sight to the blind, to set at liberty them that are bruised. "To preach the acceptable year of the Lord." "And he closed the book, and he gave it again to the minister, and sat down. And the eyes of all them that were in the synagogue were fastened on him. "And all bare him witness, and wondered at the gracious words which proceeded out of his mouth. And they said, Is not this Joseph's son?" And rose up, and thrust him out of the city, and led him unto the brow of the hill whereon their city was built, that they might cast him down headlong." "But he passing through the midst of them went his way,"
And they were astonished at his doctrine: for his word was with power." Jesus knew what he needed to do, and he did it. Pure epic-ness. It was time for his ministry to begin. As he thus quoted from Isaiah 61, so he did. He went about preaching, healing, recovering, and freeing. Jesus did exactly what he said he would do, because he was exactly who he said he was. He had power because he was true. His mission was being funded by God's power, and he would accomplish everything he set out to accomplish, no matter what anyone else had to say about it. Only God's will mattered, not the measly wills of men. It reminds me of a Bob Dylan quote, and I hope this isn't sacrilegious, but: "When you feel in your gut what you are, and then dynamically pursue it -don't back down and don't give up- then you're going to mystify a lot of folks." I love how Jesus begins his ministry by reading a scripture. He did not start things off with a gigantic miracle, he only, very simply, verbally pointed out the divinity of his mission, in a local synagogue, participating in a normal custom. His listeners were mystified. Little did they know who they were trying to kill. Jesus stayed true to his purpose, even when his own people rejected him on home turf. I think we can learn a lot from this. I think we need to a) learn who we are, b) proceed, not with reckless abandon, and not with pansy caution, but with full intensity of purpose, and c) find that we will be able to accomplish what we were sent here to accomplish, d) mystifying many. Melissa Condie is a middle school orchestra teacher in Houston, Texas. Read her other guest posts here.